An elder cousin daubed the blood that dripped from a wound near Thaer Jouda’s left eye Tuesday afternoon as the nine-year-old lay in a bed in Gaza City’s al-Shifa hospital. “He’s very good in English,” the cousin said. But Thaer, his face and body lacerated by shrapnel from an Israeli airstrike on Sunday and his right leg amputated at the knee, had little interest in talking. The bombing, which injured Thaer and his eleven-year-old sister Rahaf, also killed his mother Rawiya (43 years old), his sisters Tasnim (14) and Raghida (13) and his brothers Muhammad (8) and Usama (6). The five deaths made the Joudas, residents of Tal al-Zaatar in the northern Gaza Strip’s Jabaliya area, one of the hardest-hit of the 91 families counted by the Palestinian Ministry of Health who lost multiple members during single attacks during Israel’s 51-day military offensive. An earlier list from the United Nations Office for the Coordination of Humanitarian Affairs, including some casualties not yet confirmed by the Ministry of Health, counted 140 families that had lost three or more family members in a single incident by 20 August. 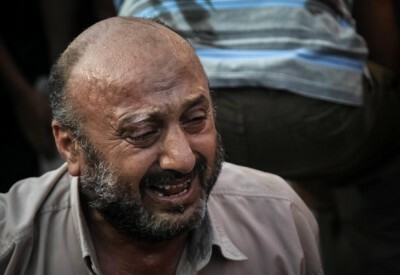 Many families were killed by Israeli strikes on almost 190 mosques, more than 140 schools and other civilian institutions, some used as shelters for Palestinians displaced from their homes by Israeli military operations near the barrier that separates Gaza from present-day Israel. The Al Mezan Center for Human Rights has recorded at least 990 people killed inside their homes in Israeli attacks, including 324 children. That’s almost half of all people killed in the Israeli assault. Israeli strikes affected at least 10,589 homes, 2,715 of which were completely destroyed, by 25 August. In the hallway outside Thaer’s room, his father, Issam, recalled the airstrike that ended the lives of his wife and four children two days earlier. After checking his surviving daughter for injuries, Issam said, he told her to leave the house quickly. Looking at the rest of his family in the hall, he said, “They lay with shrapnel everywhere and a pool of blood around them. It’s like they were swimming in it. There were six of them, five killed. “I heard the voice of my son saying, ‘Dad.’ The others were scattered everywhere. You couldn’t distinguish between them because of the heavy shrapnel wounds in their faces. At the hospital, Issam said, Thaer was alert, asking him for water. “In another bed, I saw my little boy, Usama. He was smiling in his sleep. I tried to hug and kiss him. There was no response. On Saturday, Issam said in passing, he had bought his youngest son a track suit for the winter.